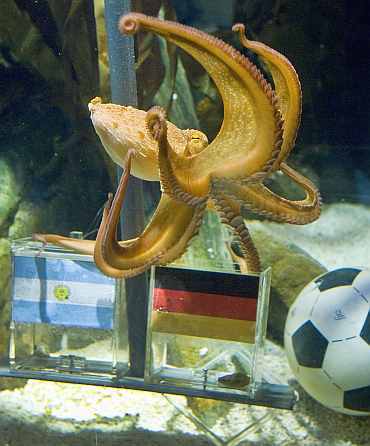 Paul, the oracle octopus who shot to fame in the World Cup this summer for his uncanny ability to predict the results of Germany's football matches, has died at his home in Oberhausen at the age of two. English-born Paul made headlines across the globe after he correctly forecast how Germany would fare in seven matches, before his psychic powers were tested again for the final. After Germany's semi-final defeat, Paul tipped Spain to beat the Netherlands in the final, which prompted one news agency to report he had spurred a jump in demand for Spanish government bonds. Paul's prediction duly came to pass: Spain won. Staff at the Oberhausen Sea Life Centre in western Germany said in a statement they were "devastated" to learn of Paul's death when they returned to work on Tuesday. "He appears to have passed away peacefully during the night, of natural causes, and we are consoled by the knowledge that he enjoyed a good life," said the centre's manager Stefan Porwoll. 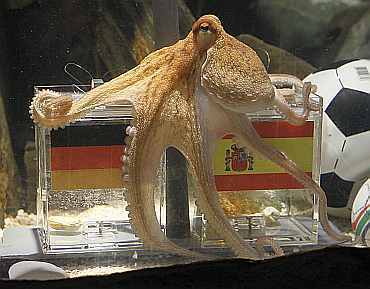 Before matches, two containers of food were placed in the eight-legged creature's tank, each one bearing the flag of one of the teams about to compete for their chance to become world champions. The container Paul picked first was seen as his pick. 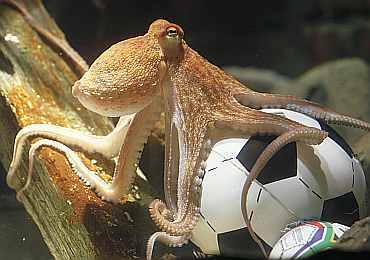 Following the World Cup, a Spanish zoo made a transfer bid for Paul but his German keepers refused to sell. Paul will be kept in cold storage until the centre decides how to mark the mollusc's extraordinary life, Porwoll added. "We may decide to give Paul his own small burial plot within our grounds and erect a modest permanent shrine," he said. Paul, who was hatched in Weymouth, England, may yet continue to dazzle the world with predictions from beyond the grave. A Russian newspaper said in July it had got Paul to predict who would be Russia's next president -- but that the results would be kept secret until the election year of 2012. Sea Life said Paul would live on as the object of a host of commercial enterprises ranging from special clothing lines to mobile phone applications inspired by his fame in Oberhausen, one of Germany's most cash-strapped cities. Meanwhile, donations made in honour of Paul's achievements would help to fund a planned permanent rescue centre for sea turtles on the Greek island of Zakynthos, Sea Life said.